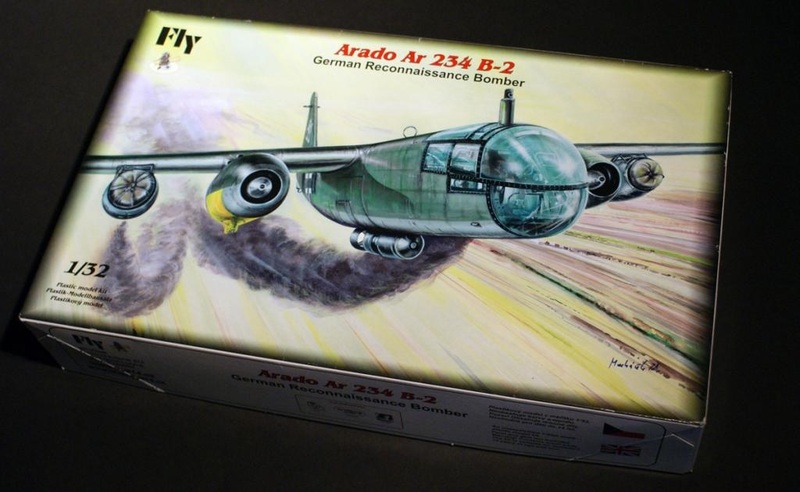 Fly Models have started producing some interesting kits, and this is one of them. As far as I know, this is the only game in town for an AR-234 in 1/32 and its a pretty good effort. Despite being officially a bomber, the AR-234 is a single seater and not a particularly large aircraft, being roughly the same overall dimensions as a modern fighter jet and the 1/32 scale suits it very well. It has a wiff of the limited run about it - no location lugs, soft beige plastic, slightly thick (but still clear) transparent parts and hastily put together instructions that in places do not represent the parts very well nor give precise locations. Another annoying factor is that despite it being represented on the artwork, there is no bomb included. However there are a large number of nicely cast resin parts (mainly for the cockpit) and a photo etch sheet, and well printed decals offering a good variety of options. The cockpit in particular builds up spectacularly, which is just as well given how visible it is under the glass nose. This model was built from the box with the exception of the addition of metal undercarriage parts from SAC and a small number of wiring and plumbing additions. You can see the build progress photos via the FaceBook page here.